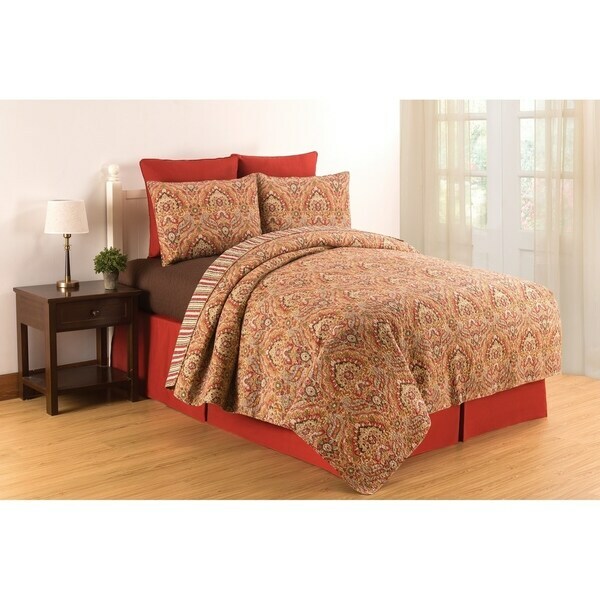 Add bohemian touches to your bedroom decor with the Mirabelle Quilt Set. With a lovely all-over damask design composed of Paprika, Cocoa, Gold, Green and Slate, along with a subtle quilted design, this quilt looks great in any bedroom of your home. Reverse to paprika, gold and slate striped pattern for additional styling options. Pair with our Paprika Euro shams and bed skirt for the finishing touches. Crafted of cotton and machine washable for easy care. Accent pillows, euro shams and bed skirt sold separately. Love this pattern? Mirabelle is also available in a tabletop collection, quilted throw and a ruffled valance.